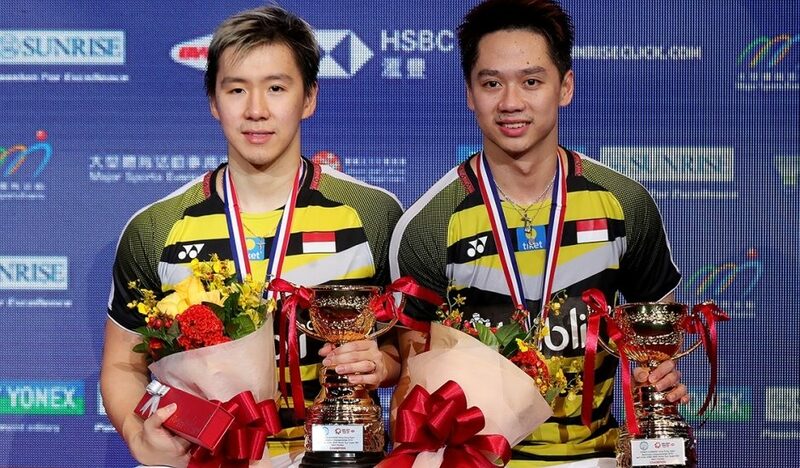 A record eighth HSBC BWF World Tour title by Marcus Fernaldi Gideon and Kevin Sanjaya Sukamuljo highlighted the finals of the YONEX-SUNRISE Hong Kong Open 2018 today. Bringing the curtains down on another riveting day of action at the Hong Kong Coliseum, the livewire Indonesians crushed archrivals, Takeshi Kamura/Keigo Sonoda, in anticlimactic straight games to surpass their haul of seven titles in a season achieved last year and equalled last week when they conquered the Men’s Doubles field in the Fuzhou China Open 2018. In humbling the No.4 seeds, 21-13 21-12, the world No.1 pair thwarted Japan’s quest to become the first nation to win four titles at any World Tour event. “I’m very happy with our performance. We played really well today and put the opponent under pressure. It was a very good match for us,” declared 27-year-old Gideon. Meanwhile, Sukamuljo said he never thought about establishing a new season record regarding the number of tournaments won. He just tried his best in every event. “Today we never lost focus and kept pushing them,” he noted. 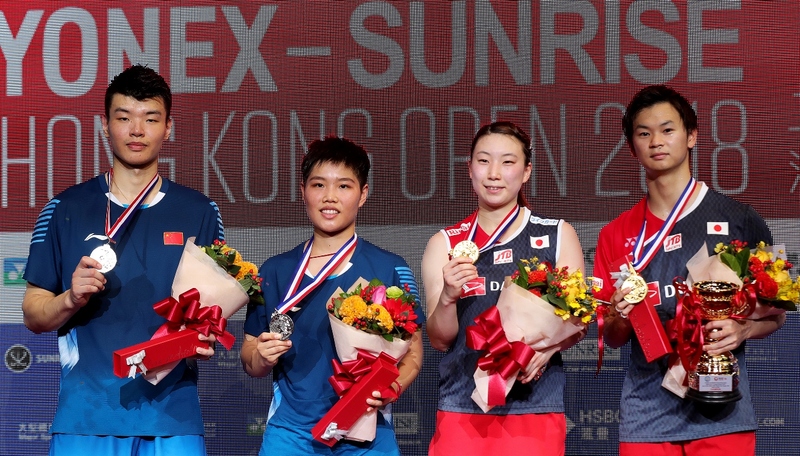 The Land of the Rising Sun featured in every match this afternoon, however, its chance to sweep the honours was thwarted halfway through the proceedings by another sterling performance from Men’s Singles ace, Son Wan Ho. 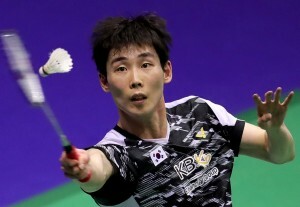 The Korean worked his way from a game down – shaking off regrets at not capitalising on his 10-2 lead – to oust Kenta Nishimoto in 89 minutes, having taken a minute more to battle past Nishimoto’s accomplished team-mate, Kento Momota, in the semi-finals. Son’s 14-21 21-17 21-13 victory saw him wear down his Japanese opponent who was clearly struggling in the latter stages of the contest; sprawling on the court fatigued at one point, having chased the shuttle to all corners in vain as he was undone by a neat cross-drop. The manner of 30-year-old Son’s win – ending with an angled smash – will certainly boost the confidence of a player who has lingered in the shadows of his more accomplished peers, though he has even reached the coveted world No.1 position. The Super 500 crown was the No.6 seed’s third at this level but his first in four years and his second Hong Kong championship. “I am very pleased to win because it’s my first title in two years. Yesterday, I had very long rallies and today, in the first game, I was winning but still lost it. In the second game, I felt my opponent was tired and I had to play long rallies to stay ahead. That was tough,” said an elated Son. Japan’s day started brightly with success in Women’s Doubles, compliments Yuki Fukushima/Sayaka Hirota, followed by Nozomi Okuhara’s win over Ratchanok Intanon in a gripping Women’s Singles encounter. Having suffered an uncharacteristic error-strewn final versus Chen Yufei last Sunday, Okuhara was keen to make up this weekend. The No.7 led the first game from start to finish and withstood her determined Thai opponent in the second; saving a game point and clinching victory on her third opportunity (21-19 24-22). Meanwhile, top-seeded Fukushima/Hirota beat Korea’s Lee So Hee/ Shin Seung Chan, 21-18 21-17, in the day’s opening match. 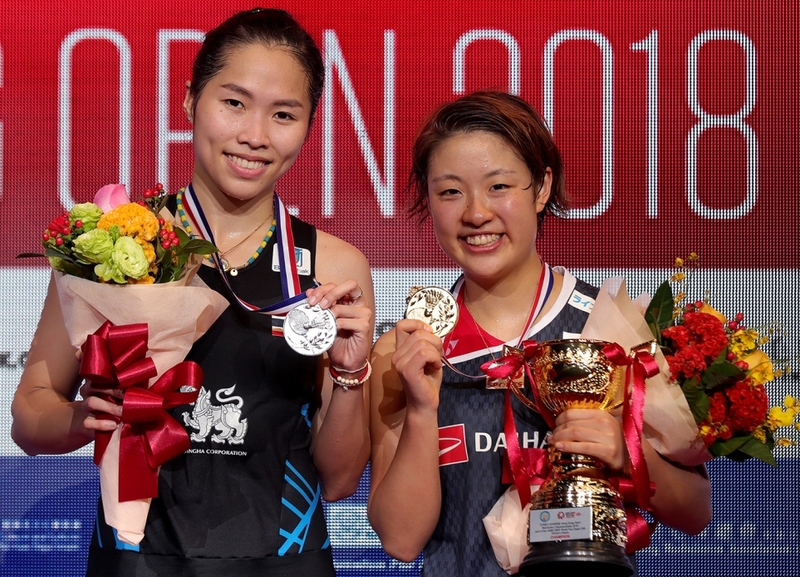 Japan’s third triumph was a surprise win by Yuta Watanabe/Arisa Higashino over a Chinese pair boasting a 5-0 head-to-head record against the All England champions. However, it was not to be Wang Yilyu/Huang Dongping’s day as their firepower was nullified by the smart interceptions, quick movement and fierce determination from across the net. Ultimately, the No.2 seeds were tamed 21-18 21-14 in 46 minutes.